• Stocks Trim Weeky Gains. U.S. stocks finished lower on Friday, trimming weekly gains as a two-week plunge in oil prices and an earnings-driven resumption in tech selling sparked investor angst. A stronger-than-expected gain in U.S. wholesale prices and 11.7% drop in Chinese auto sales also ignited concerns about the global economy. • Weekly Performance. For the week, the S&P 500 advanced 2.21%, the Dow Industrials gained 2.84%, while the tech-heavy Nasdaq Composite rose 0.74%, its first back-to-back weekly gain in two months. The S&P 500 gained 4.71% over the past two weeks, its strongest two-week gain since late February. • Producer Prices Jump. The Producer Price Index (PPI) rose 0.6% in October, the biggest jump since 2012 and core producer prices rose 0.5%, both well above consensus expectations. The PPI is up 2.9% from a year ago, while core wholesale prices are up 2.6% YoY. Separately, The University of Michigan’s preliminary November survey of consumer sentiment reached 98.3, falling less than forecast, but down from 98.6 in October. • Healthcare Performs Best. Ten of the 11 major sector groups ended with gains last week, led by Healthcare (+4.08%), Real Estate (+3.71%) and Utilities (+3.21%). Energy (+1.21%) gained the least, while Communication Services (-0.19%) declined. • Treasury Yields Weaken. Treasury securities rallied, sending yields lower across maturities with two-year Treasury notes down 4.1 basis points to 2.93% and 10-year yields falling over five basis points to 3.18%. The U.S. Dollar Index rose 0.37% last week to 96.905, while WTI crude oil fell 4.67% last week, extending its bear market plunge to 21.1% from its most recent high of $76.24 on October 3. Friday, November 16: Industrial Production, Manufacturing Production, Kansas City Fed Mfg Activity. The elevated volatility in equity markets this year has brought down valuation levels for stocks. Earnings growth has remained strong, while U.S. stock returns have been in the low single digit range and international stocks have produced negative year-to-year (YTD) returns. 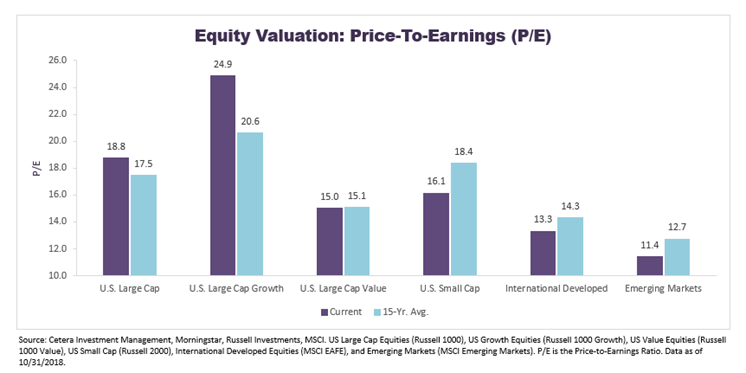 The Price/Earnings (P/E) multiples for several major equity categories have come down significantly from their peak in late January, reducing the high valuation headwind that most equities faced, U.S. growth stocks being the notable exception. Rising interest rates and bond yields have also suppressed valuation multiples for stocks this year. The result has been near or below historical average price levels for U.S. value stocks, U.S. small caps, International Developed markets, and Emerging markets. These areas are all trading at or below their 15-year average P/E level. Volatility is likely to remain elevated in equities as the bull market ages and interest rates normalize, but areas of the market that have below-average valuations are providing more opportunities for long-term investment appreciation. In the short run, sentiment has a big impact on returns, while in the long run, valuations and market fundamentals drive returns.